This is a HALAL & KOSHER certified product & produced under International GMP guidelines. It contains Eleuthero sinensis popularly known as Siberian Ginseng is a powerful adaptogenic herb. It has been carrying a plenty of benefits in eastern medicine for thousands of years enjoying a history of both safety and effectiveness. 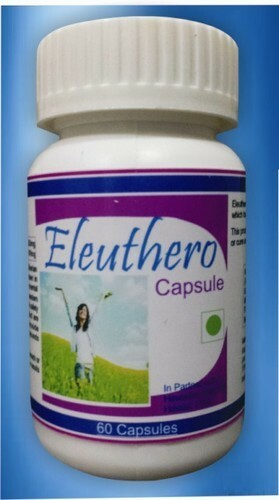 The Eleuthero root used in this product is carefully selected based on high eleutheroside concentration, the plants active therapeutic compounds delivering maximum effectiveness. Pharmaceutical industry. It is acclaimed by its customers for its Quality, Performance and Reliability All the Ayurvedic range of products is manufactured in our most modern manufacturing unit in Himachal Pradesh. Our facility in Himachal has manufacturing capacity of more than million stock keeping units (SKUs) per day having world-class facility and is equipped with Proprietary manufacturing technology. Its core focus is on manufacturing different formulations. This facility is equipped with all kinds of sophisticated equipments and trained manpower for carrying out the processes as per the international regulatory standards. This plant is dedicated for formulation of Ayurvedic products. Natural Herbs provides private label and custom packaging services with the products that best suits the needs of its customers. Our state-of-the-art processing equipment efficiently re-packages and customized labels produce as per demand. Private labeling and customized packaging allows our customers to market our consistent top quality products with their own label for optimum brand recognition and brand loyalty. We are dedicated towards providing the most natural solutions for building a healthier & better living. Our excellence lies in bringing forth the supreme quality products by following a standardized & specified system inbuilt. This comes its way by the inception of modern research & vigilant monitoring quality assurance systems for every single output. Our team of herbalists are well equipped & expert to discover & formulate the advanced & uniform quality herbal healthcare products with scientific and clinical verification.